I had a Skype chat recently with Ken Banks who pointed me to an excellent article about m-Pesa, a system operating in Kenya that uses mobile phones to provide an easy way of making payments. The article is, The Invisible Bank: How Kenya Has Beaten the World in Mobile Money, by Olivia O’Sullivan. Click a few keys, exchange a few numbers, and it’s done. With just a mobile phone and a registration with Safaricom, Kenya’s mobile service giant, you can pay for anything in seconds – no cash, no long journeys to towns to reach a bank, and no long lines when you get there. This is m-Pesa, the revolutionary approach to banking which is changing economies across Africa. The service allows customers and businesses to pay for anything without needing cash, a bank account, or even a permanent address. So how does it work? m-Pesa relies on a network of small shop-front retailers, who register to be m-Pesa agents. Customers come to these retailers and pay them cash in exchange for loading virtual credit onto their phone, known as e-float. E-float can be swapped and transferred between mobile users with a simple text message and a system of codes. The recipient of e-float takes her mobile phone into her nearest retailer when she wants to cash in, and swaps her text message code back for physical money. There are already more m-Pesa agents in Kenya than there are bank branches. This case demonstrates how any credible entity (like a phone company or power company) can now become a depository “bank” that enables credits denominated in any chosen units (hopefully, objectively defined units like phone minutes or kilowatt hours) to be easily transferred from one account to another via cell phones. Networks of existing storefronts (like 7-Eleven convenience stores) are being added on top of cell phone technology to enable deposits into and withdrawals from any account. That could potentially be done in any desired currency. As an example, 7-Eleven stores in Thailand have begun to accept payments for purchases made online. The advantage is that no credit card is required. I’ve used this service myself when I booked flights online with NOK Airlines, a Thai low cost carrier. Once booked, one has 24 hours within which to trot on over to any conveniently located 7-Eleven and pony up payment, usually in cash. In my case, I paid in Thai Baht notes that I drew from a nearby ATM using my debit card and drawn on my credit union account in Arizona. 7-Eleven also sells prepaid cell phone minutes. They could easily add acceptance of cash payments to add credits denominated in any desired units to an account (i.e., deposits). While m-Pesa fees are relatively high for small transactions, that is likely to improve as competing companies enter the field. 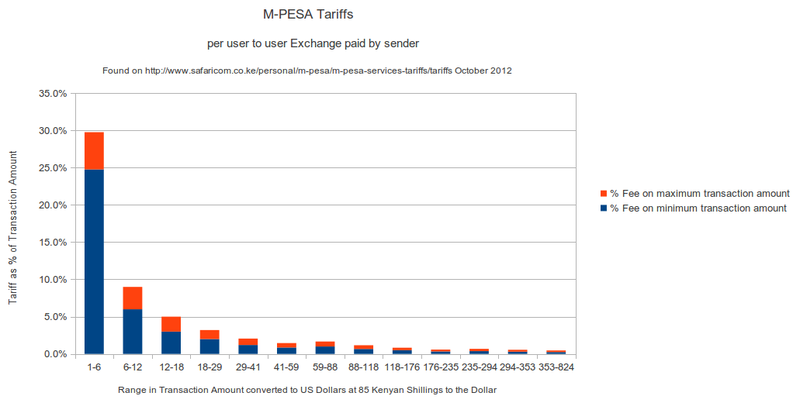 Here, is a chart of the m-Pesa fee schedule. 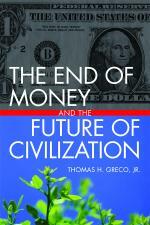 The monetary and financial revolution is just a matter of putting existing components together. The hardest part will be in negotiating the minefield of laws, regulations, and taxation policies that protect existing monopolies and fiefdoms. But once begun, it will be increasingly difficult to stop this snowball from rolling downhill. –t.h.g. This entry was posted in Banking, Emerging paradigm, Exchange Design and tagged m-Pesa, mobile payments, mobile phones. Bookmark the permalink.